PULLMAN, Wash. – A Washington State University researcher for the first time has modeled how microplastic fibers move through the environment. The work, published in the November print issue of the journal Advances in Water Resources, could someday help communities better understand and reduce plastics pollution, which is a growing problem around the world. Millions of tons of plastic waste in tiny microscopic pieces are bobbing around the world’s oceans and are finding their way into soil, sediments and freshwater. Plastic debris comes from many sources including synthetic clothing fibers, cosmetics, packaging and industrial processes. These plastic bits often end up in the oceans, harming the marine life that eats them. 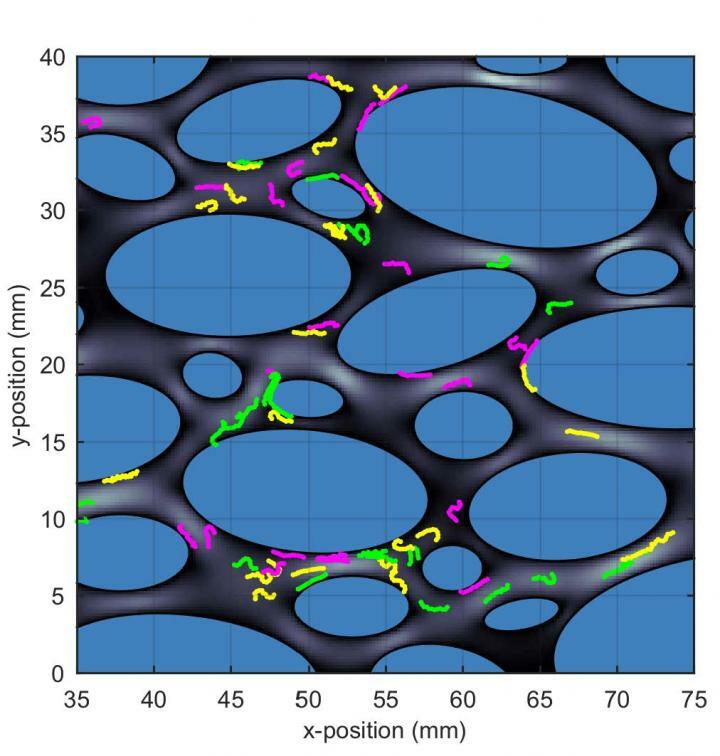 Researchers have studied and measured microplastics in a variety of environments, but Nick Engdahl, an assistant professor in the Department of Civil and Environmental Engineering, is the first to model how the synthetic fibers move. “I wanted to know whether they keep moving and spreading or if they just accumulate in one place,” said Engdahl, who has studied the movement of a variety of contaminants in the environment. He used a novel physics-based approach to simulate the movement of microplastic fibers, specifically. These synthetic fibers in clothing are created during their manufacturing process. “Every time you walk or rub against something your clothes are shedding fibers,” said Engdahl. The microfibers, which are mainly released when clothes are washed, end up in wastewater plants, where a significant proportion pass through water filtration systems. Even the ones that are filtered end up in the sewage sludge that can be applied to farm soils as fertilizer or dumped in landfills. Engdahl found that the length of the fibers and the speed of water that they’re floating in determined whether they settle in soil or continue moving in the environment. He also found that the movement of shorter microplastic fibers was complex, and that they moved faster than dissolved substances in the water. Engdahl is working to verify and refine his model against direct observations of microplastic fiber movement in a lab. He also plans to measure the fibers in a wastewater treatment facility.